Built in 1918, the Scottsbluff Drain originally intercepted groundwater from farm land northwest of the city and redirected it around the budding city to the North Platte River. The photo from the North Platte Valley Museum archives shows Scottsbluff around 1940. 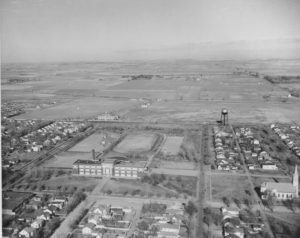 The large building is Scottsbluff High School, now Bluffs Middle School. Northwest of the school’s track is a smaller building where Webber’s Furniture now sits on the north end of Broadway. 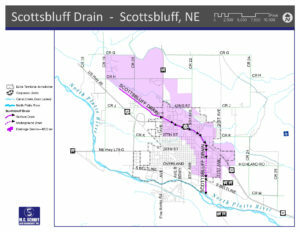 Today the drain carries groundwater, irrigation wastewater, and stormwater runoff from the part of the county and the majority of the north and northeast sections of town, as seen in the map from MC Schaff. While the city has grown, the Drain remains the nearly the same almost 100 years later.